OriginalMailboxFactory.com mailboxes and mailbox posts are manufactured and assembled right here in the U.S.A. from quality materials via proven technology. ...are made to last. Are you tired of having to replace your rusted mailbox? Or has your plastic mailbox been faded and fried by the harsh rays of the sun? Have vandals been taking batting practice at your expense? Having problems with theft? OriginalFactoryMailbox.com has the solution to your problems! ...have had similar dilemmas, but they no longer suffer such difficulties after shopping at OriginalMailboxFactory.com. That's because our heavy steel plate mailboxes are extraordinarily rugged but still have a classic beauty that will last for years. ...are manufactured to the very highest quality specifications and are handcrafted entirely in the U.S.A. from the finest steel money can buy. 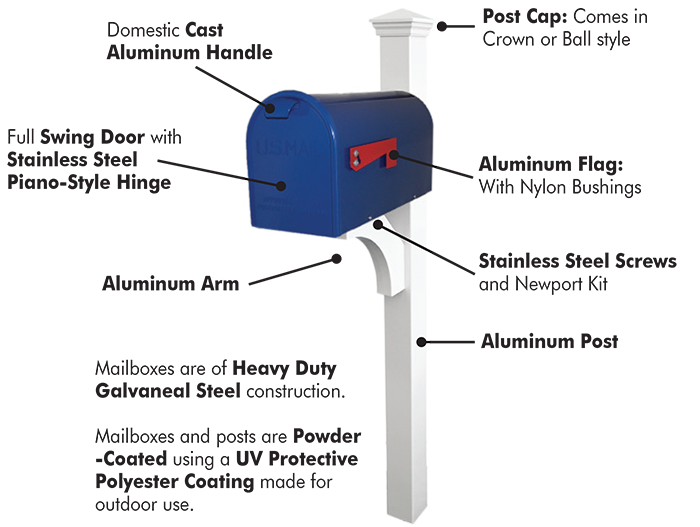 Each and every mailbox meets or exceeds all U.S. government standards. We use a full length, full swing stainless steel hinged door, and a steel flag with stainless steel fasteners. We're so confident in our products that each of our mailboxes comes with a limited lifetime warranty that ensures this could be the last mailbox you ever buy! ...but they're attractive, too. Our durable powder coat finish looks beautiful in any neighborhood. ...at OriginalMailboxFactory.com. There's no need to waste any more time or money on inferior products at discount hardware stores when you can get factory direct pricing from us for the highest quality product available. Take a look at our mailboxes and mailbox posts, and place your order today!